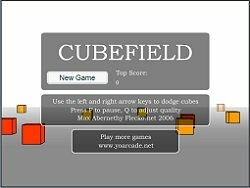 To begin playing Cube Field, click the Small, Medium, or Large link or Very Large button under the picture at left. This opens the game in a pop-up window. Wait for the game to load, then click the "New Game" button to get started. Note: The HTML5/Mobile version works on desktop computers, tablets, and phones. It is the same game. If you like Cube Field, you might also enjoy the other free concentration games on this site, such as Flash Curveball and Neon Rider. This game trains brain skills like visual perception, reaction time, and concentration. You use these brain skills during physical activities such as playing sports or driving a car. As you progress through this game, the background of the screen changes. At first you see a gray foreground with a white sky. After awhile, the color scheme changes to black and fluorescent green. Don't let this distract you! It's all about staying focused. Other related games that also train concentration and reaction time include Tennis Game and Mario Table Tennis, a fun to play Mario game. This game is simple but intense. The first time you play it, you probably won't last more than a few seconds. But stick with it - after a few minutes of practice, you'll be zooming through that cube field like you were on auto-pilot. HOW TO PLAY. Use the right and left arrow keys to guide your ship through the field of cube-shaped obstacles. But you better focus intently, because your ship is moving at high speed. Don't run into any of the cubes, or you're done. My high score is 293785. See if you can beat that! I find it easier to avoid the cubes if I zoom the game as large as possible. To make the Cube Field game as big as your computer screen, click the small square in the upper right corner of the game window. You'll also do better if you don't move your ship wildly from left to right across the field of cubes. Keep your eyes focused on the path right in front of the direction that you're traveling. That way, you'll only need to make slight left and right adjustments to your path as cubes appear in front of you. Got any tips on how to beat Cube Field? (or at least how to survive longer?) Send me a message through my Contact Me page describing your technique. If I like your tip, I may post it on this page! No cheats or glitches though, please. Cheating at a game defeats the purpose of using it for brain training. 03/12/17. Nicholas said: " I just beat your score. I thought I would never do it, and my score was 2,367,890. I took your advice. It worked, thank you, and mine is that you should remember what happened in each level and take the same route every time and do the right route where you died. " 4/05/15. Faith said: "My high score was 22,872,440 and still trying to beat it. 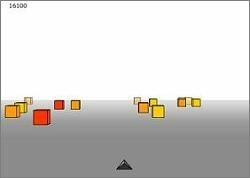 I first played this Cube Field game when my friend showed me it. We had a contest to see who would win, and that's how I became ADDICTED to the game. I love the game. Just a tip: Get your mind set on a goal and conquer it. Also have contests against your friends to prove you're the best." 3/21/15. Preston said: "I've played the game for about a year and a half, and my top score is 22,483,981. The trick is to calm yourself completely, squint your eyes, and put all but the two fingers you're using in your lap, Then just spend like 6 months playing the game. Easy." 11/07/14. James said: "My highscore was 1,458,347. No hacks or glitches involved. I spent a lot a of time playing." 11/21/13. Alexander said: "I got to 833,430. I just spent a lot of time playing, and perfecting my reaction timing. No cheats involved." 10/29/13. Olivia said: "Hi! For the Cubefield game my top score was 499,085. I'm pretty sure that score was made by my higher attentiveness from adrenaline as I was playing it during my physics class trying not to get caught! Hahahah thanks!" 10/25/13. Kaden said: "All I do is look above my triangle then look and see where he can go. If I crash, I go again, but all I do is sit back, relax, then breath calmly and play. My high score 310,800." 10/4/13. Jessica said: "My score was 658,953. I just stayed relaxed and concentrated on the screen, while in a quiet room by myself. Good luck to the other gamers." 5/15/13. Brittany said: "My highest is 431,890. I got it by staying to the left and dodging the cubes as I went. My experience shows that the left has less cubes." 5/01/13. Alan said: "My high score was 431,425. I got this far by relaxing and staying in one space and dodging the cubes as they came." 01/11/13. Nena said: "I have beat your score. All you need to do is just keep your eyes straight on the path." 01/11/13. Adam said: "After a lot of trying I have finally succeded to beat your score. My score is 315,900. My playing technic is based on serious concentration first, and I also use my visual field to see the wide spaces throught the cubic field in front of me." 12/17/12. Adrianna said: "My high score was 5,758,789. My tips or helpful ideas are: 1. Use your index fingers to control (it works for me, maybe it will work for u :)) 2. If it's your first time playing, maybe just sit back relax get a little snack and drink and the take a breather and just play. 3. My last tip or (advice) is to just look above the triangle and just do your best. Its just a game, so it's okay if you die in seconds for a couple of times. It's normal, it's not like it's life:) ITS A GAME:)"
10/03/12. HowHow said: "506,130 is my high score. It seems to be helpful to focus on the open space instead of the squares you need to dodge. Also, it doesn't matter how much you turn, when you reach the end of a field, the passage will wind up straight ahead of you." 9/21/12. Austin said: "My highscore was 507,350. My technique is to stay in one place and dodge them. Come back to the same place as soon as you do this." 9/12/12. Jaime said: "I have made it to 690,485 with the pink cubes and flying weirdly shaped rocks above. I find it easy to stare at the center of the game and use my right pointer and ring finger to move." 6/21/12. Jason said: "I find it easier to keep your fingers on the left and right arrows, so when cubes come in front of you it's easier to avoid them and steer." 5/11/12. Marisa said: "Look right in front of the triangle and watch for any cubes heading for you. Don't stare at the triangle because you won't see cubes coming and you will have less time to move. Also, by looking straight at the triangle, you won't know which way to move and how far. The farthest I ever made it in this game is right at the end of the third stage with the cubes black and rest of screen white. :)"
5/06/12. Leica said: "Hey! I just got the score of 489,485 the best way to get the highest score possible, is to put the screen on large, sit back, relax, don't worry, and don't get to annoyed, be calm. That's what I did, and I got the score of 489,485." 4/18/12. Nicklaus said: "The way to beat it is to calm yourself and think of yourself as the cube. I did that and my top score is 3,899,465." 4/18/12. Jasmin said: "I just got the score of 411,305. A tip i would give is to just focus your eyes on one place in the game, which is right above the triangle, then dont move them and stay focused :)"
4/06/12. 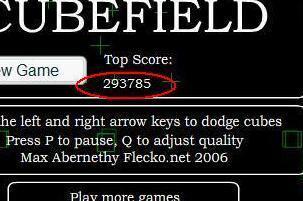 Hamish Sproule said: "Got 1,357,567 by using both index fingers for the arrow keys." 3/30/12. Nicolebbyx said: "Hey, I got the score of 395,465! My trick is to put my face right up to the screen so it looked much better, and I kept practicing! (of course)." Game distributed by y3.com Used with Permission. If you found the page above interesting, fun, or useful, please click the "Like" and/or "Share" button below. Feel free to leave a comment as well. Thanks very much! No sign-up or log-in needed. Just go to a game page and start playing! GAME TIP #1: Many games on this site such as Curveball were built with Adobe Flash. To play these games, you must allow the free Adobe Flash Player to run in your browser. If you don't see an animation in the red rectangle above, click in the red rectangle and activate your Flash Player. Then the Flash-based games should open for you. If you see a message that the Adobe Flash Player is "blocked", go to your browser's Settings page and change Block to Ask First, if possible. If the red rectangle is empty, your browser might not have the Flash Player. To check this, follow the steps on Adobe's Flash Player Help page. GAME TIP #2: If you cannot get the Flash-based brain games to work, try the HTML5 brain games instead. HTML5 games do not use the Adobe Flash Player. They work in modern browsers automatically. All the HTML5 games are listed on this page. Copyright © Memory-Improvement-Tips.com. All Rights Reserved. Reproduction without permission prohibited. Copyright © 2006 - 2016 Memory-Improvement-Tips.com. All Rights Reserved. Reproduction without permission prohibited.